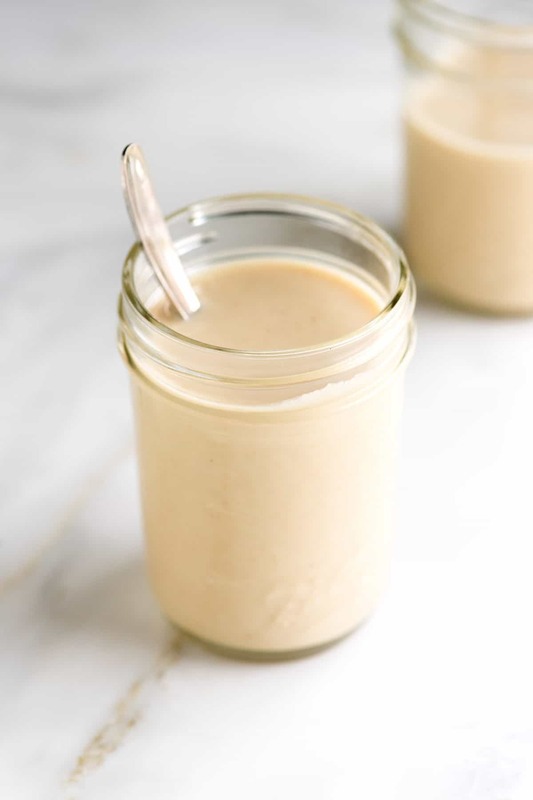 Homemade tahini is so easy to make. Our recipe is quick and makes tahini that tastes so much better than anything you can buy at the store. 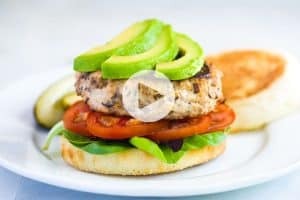 Jump to the Tahini Recipe or watch our quick recipe video showing you how to make it. Do you know what tahini is? Would you like to find out how to make it at home instead of buying pricey jars at the store? We’ll tell you all about tahini, what you can use it for (yes, it’s more than hummus) and show you how you can easily make it at home. 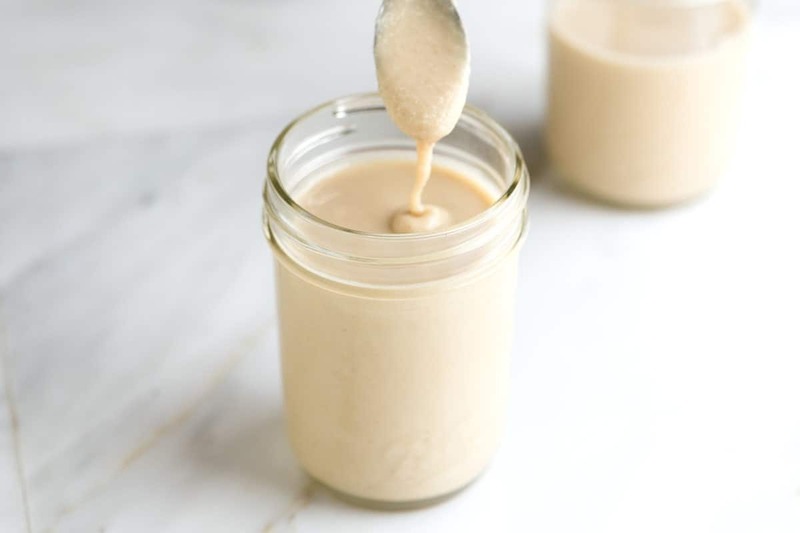 Tahini is a paste made from sesame seeds and is a staple in many cuisines, especially in the Mediterranean and Middle East. It’s vegan, gluten-free, tastes nutty, and is simple to make. Store-bought tahini is usually made from hulled sesame seeds. This is our preference, too, but you can make it from unhulled and sprouted sesame seeds. Hulled sesame seeds are what you see most often in stores. Here’s a photo of both hulled and unhulled sesame seeds. The hulled seeds are the lighter color on left. On the right, the unhulled seeds are much darker and still have their hull or outer shell intact. Hulled sesame seeds are the lighter color on left. On the right, the unhulled seeds are much darker and still have their hull or outer shell intact. 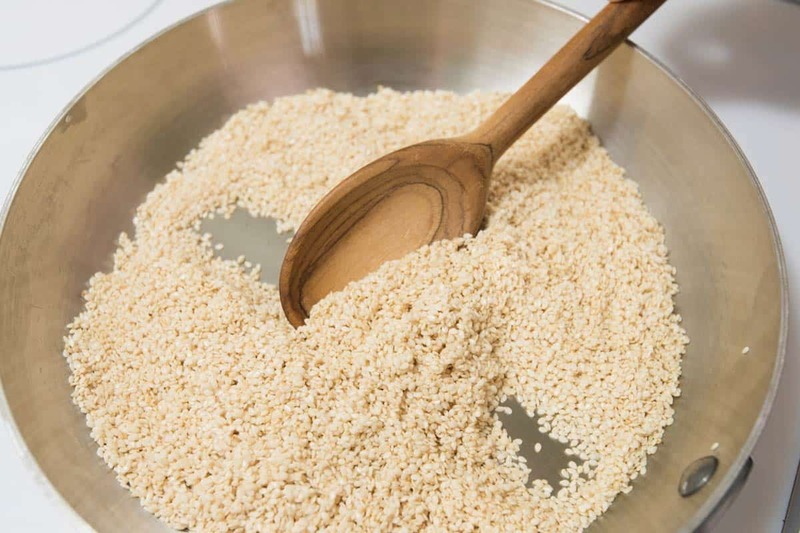 In our experience, tahini made from unhulled sesame seeds tends to taste more bitter and the tahini does’t get quite as smooth as when it is made from hulled sesame seeds. 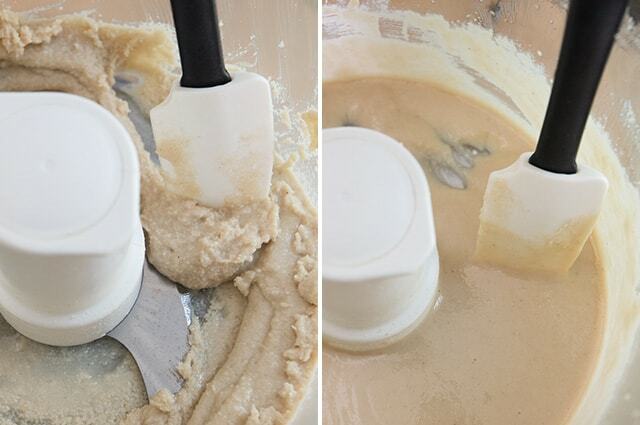 Arguably the most well known way to use tahini is when making hummus. Even though we are huge hummus geeks, we use tahini many other ways in our own kitchen. Here’s a list of suggestions for how to use tahini, other than in hummus. Make Baba Ganoush, an incredible roasted eggplant dip that, dare I say it, might beat out hummus for our favorite dip. Make your own tahini salad dressing. Give this Kale, Bean and Walnut Salad with Tahini Dressing a look. Turn it into a sauce. Give our Dreamy Tahini Sauce a try, which is perfect drizzled over vegetables or meats. I especially love it over Honey Roasted Carrots and drizzled over these Chicken Lettuce Wraps. Use it in dessert. Seriously. Give these Chocolate Chunk Cookies a look. Once you have tahini in your fridge (it lasts over a month), we bet you will find yourself adding it to a variety of dishes without direction from us! Tahini is very, very simple to make. If you have ever made a nut butter like peanut butter before you’ll notice it is practically the same process: Grind sesame seeds in a food processor with a little oil until smooth. You only need THREE ingredients to make tahini. Sesame seeds — As I mentioned earlier, we prefer to use hulled sesame seeds. Most often, we will lightly toast the seeds to bring out some of their natural nuttiness, but you can skip this step all together if you’d like. Oil — To help the tahini turn into a creamy smooth paste, we add a few tablespoons of neutral-flavored oil. A variety of oils work, try avocado oil, light and fruity olive oil, vegetable oil, and grape seed oil. Salt is an optional ingredient, but I always use it. It just makes the tahini taste better. Making tahini is easy and only requires a few simple steps. Step 1, Toast the sesame seeds. I love toasting the sesame seeds before making the tahini. The flavor is far superior this way. If you plan to toast the seeds, we recommend doing so on the stovetop and not in the oven. Sesame seeds are tiny and so they burn very easily. To toast the sesame seeds, I throw them into a wide, dry saucepan over medium-low heat then stir constantly with a spoon until the seeds darken ever so slightly in color and become fragrant. Toasting sesame seeds in a dry pan makes tahini with incredible flavor. Step 2, Process the sesame seeds until crumbly. When the sesame seeds have cooled, we throw them into the bowl of our food processor, shut the lid then process until a crumbly paste begins to form. A food processor turns the seeds into a crumbly mixture. Step 3, Add oil and process into a smooth cream. To help the tahini turn into an extra smooth paste, we add a few tablespoons of neutral-flavored oil. You can eliminate some of the oil if you would like, but the tahini won’t be as smooth or pourable. To reach a similar consistency as store-bought, we’ve found 3 to 4 tablespoons of oil should do it. After more processing, a few stops to scrape the bottom and sides of the bowl and a little more processing after that, the tahini is done. Extra smooth and ready to use in whatever recipe you like. After adding oil and processing for a minute or two, the tahini is smooth and pourable. Can I Use A Blender To Make Tahini? 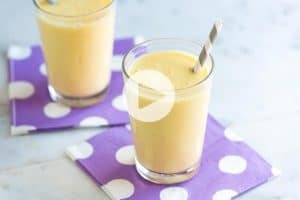 Since posting the recipe, quite a few of our readers have asked whether or not a blender will work in place of a food processor. I prefer using my food processor, but if you have a high powered blender (like a Vitamix), then you should be able to use it to make tahini. When you do, be sure to scrape down the sides and bottom of the blender often so that all the seeds are incorporated into the sauce. You can keep tahini covered in the refrigerator for a month, maybe a bit more. You might find that after some time in the fridge it separates, like a natural peanut butter would. All you need to do to fix this is stir it well. Making tahini at home is easy and much less expensive than buying from the store. We recommend looking for sesame seeds in bulk bins or at International, Asian and Middle Eastern markets for the best deals. 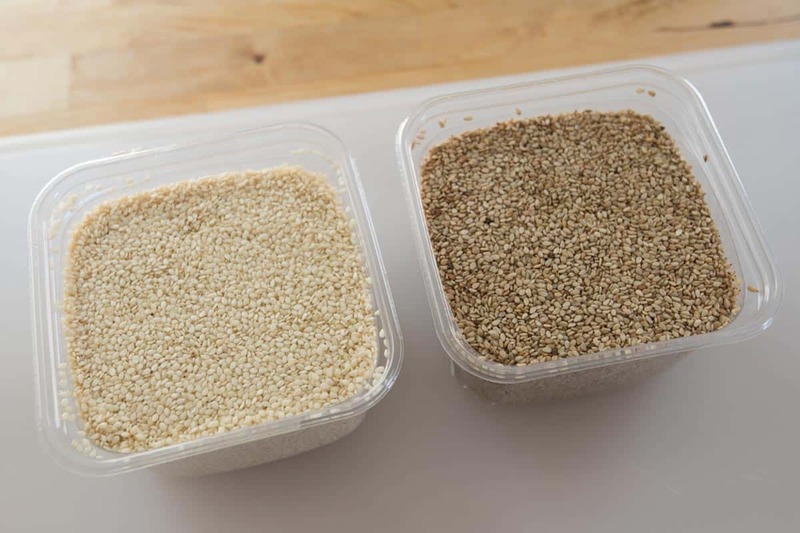 While tahini can be made from unhulled, sprouted and hulled sesame seeds, we prefer to use hulled sesame seeds for tahini. Tahini can be kept in the refrigerator for a month. Add sesame seeds to a wide, dry saucepan over medium-low heat and toast, stirring constantly until the seeds become fragrant and very lightly colored (not brown), 3 to 5 minutes. Careful here, sesame seeds can burn quickly. Transfer toasted seeds to a baking sheet or large plate and cool completely. 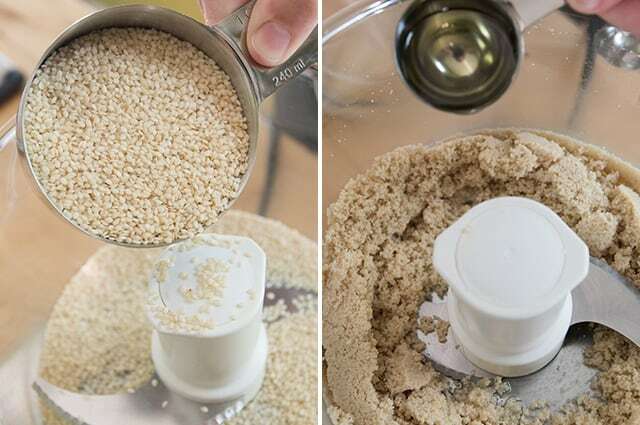 Add sesame seeds to the bowl of a food processor then process until a crumbly paste forms, about 1 minute. Add 3 tablespoons of the oil then process for 2 to 3 minutes more, stopping to scrape the bottom and sides of the food processor a couple times. Check the tahini’s consistency. It should be smooth, not gritty and should be pourable. 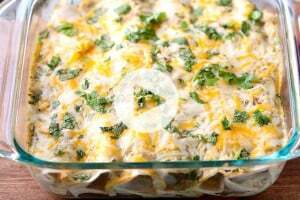 You may need to process for another minute or add the additional tablespoon of oil. Taste the tahini for seasoning then add salt to taste. Process 5 to 10 seconds to mix it in. Store tahini covered in the refrigerator for one month. You may notice it separates over time, like a natural peanut butter would. If this happens, give the tahini a good stir before using.